Lunch on the Go: Pizza Strips! Day 19: Lunch on the go. Today’s prompt couldn’t be more appropriate! I’m in Rhode Island this weekend, here to celebrate my dad’s 60th birthday and my nephew Charlie’s 1st birthday. Two days of big gatherings, bookended by days of chilling out with my immediate family. There will be lots of party foods and snacks, but I guarantee we’ll make time for one of the best on-the-go lunches: pizza strips! 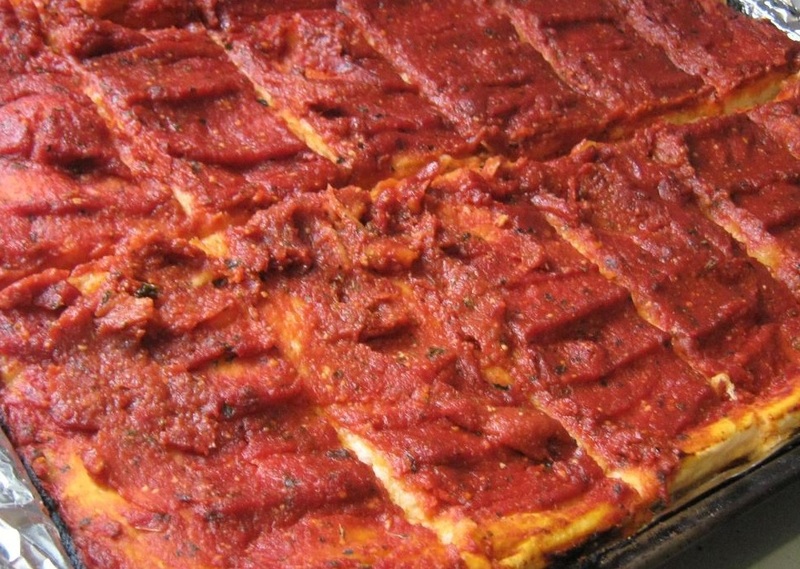 Pizza strips (also called party pizza or bakery pizza) are a Rhode Island specialty. They’re incredibly simple — a focaccia-like dough topped with a thick tomato sauce — but they’re definitely more than the sum of their parts. They’re baked on sheets and cut into strips, which you can then slice into squares for smaller portions. I think they’re very similar to an Italian tomato pie, which makes sense — RI has a big Italian-American population, and you can find pizza strips at nearly any Italian bakery. My family has always served them at parties; they’re relatively inexpensive and are a great supplement to the typical chips and veggie trays served at these kinds of gatherings. And — bonus! — they’re typically vegan, although some bakeries add parmesan cheese. I’ve always preferred the corner pieces, since I love thick, crusty bread. When I was a kid, I didn’t like the tomato sauce topping — it was too thick for me, so I’d wipe some of it off. These days, I’m far less particular, and I’m always happy to grab a piece with a healthy amount of sauce! My mom used to buy pizza strips at a bakery called the Italian Breadbox, which was just down the street from my family’s house. Sadly, they closed down years ago, so she now patronizes DePetrillo’s Bakery. She’s confirmed with the chefs that the recipe is indeed 100% vegan, so that’s my bakery of choice when Steven and I need to pick up a tray for the ride back to Maryland. Since they have no melty cheese and never have any toppings, they’re super easy to eat on the go! I’m the same with a loaf of bread, my favorite part is the end pieces.